A good way to keep our music CD collection safe, so that it doesn't suffer any imperfection or accident, is to make a back of our songs, for which we'll need a tool that allows us to record the contents of each disc digitally, with the objective of not losing quality compared to the original. 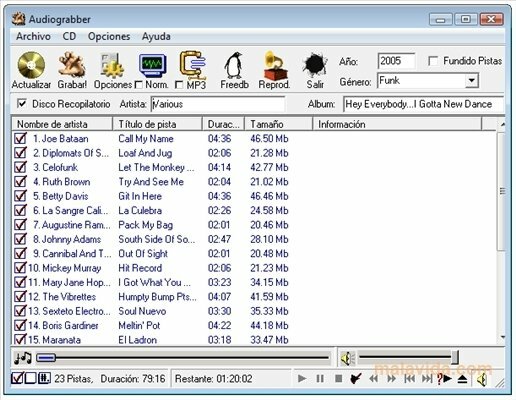 AudioGrabber can be an ideal tool for this task, because it allows the user to capture the contents of audio CDs, with which we'll have exact copies of the original WAV songs, that will later be converted to other formats (to be able to transfer them to an MP3 player, for example) or copied again to another CD. The program offers us the option to be able to remove the silences that precede each theme, normalize the audio or obtain the information of each disc from the Internet before ripping it. If you're looking for a free tool with which you can rip your CD collection to your hard drive, without losing even the slightest quality of the original songs, try out AudioGrabber.